For 14 years, approximately 30 volunteers each year from Portland Wheelmen Touring Club have devoted three Fridays in November to repair and clean bikes for the Community Cycling Center’s Holiday Bike Drive. About 860 bikes have passed through the Wheelmen’s hands – fueled by 2016 slices of pizza – to bring the gift of bicycling to children who would otherwise not have a bike to ride. The Portland Wheelmen Touring Club formed in 1971 – Oregon’s oldest recreational cycling group – and supports around 790 riders through membership. The Club pedals 365 days per year with welcome rides that get people comfortable on the street or back into cycling, social rides for the joy of biking with others, and mileage rides for the love of being on a bike. See the Wheelmen in action during two annual events, the Pioneer Century and the Seattle to Portland Finish Line. The Wheelmen wouldn’t be the Wheelmen without the club’s women. Back in 1999, Nikki Hilton initiated the Wheelmen’s volunteer wrenching tradition for the Holiday Bike Drive. She led the effort until 2006 when a new member, Karyn Mardis, volunteered to coordinate the wrenching event. 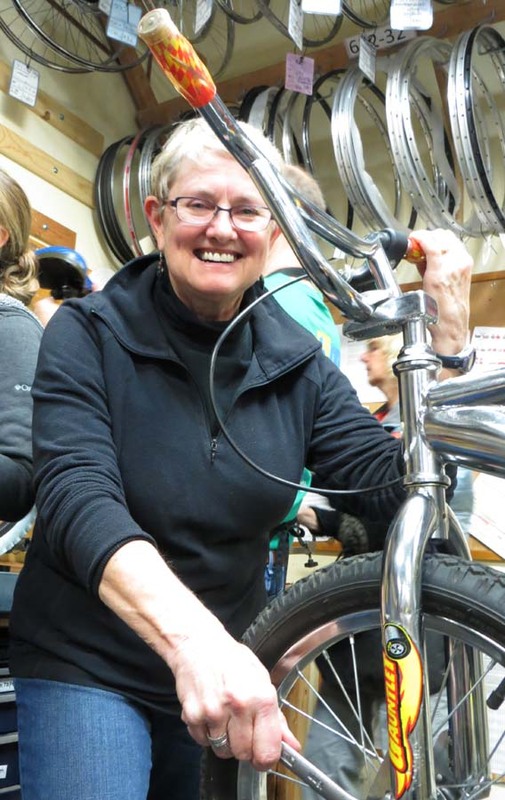 Joanie Cullen, long time board member and wrencher, takes part in the bike fix-up with as much enthusiasm as she delivers the Wheelmen’s history and highlights. Karyn, a wrencher herself, recruits and nourishes volunteers, details numbers of pizzas eaten, and ensures everyone has fun. 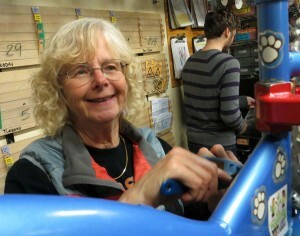 In the eight years Karyn has run the Holiday Bike Drive volunteer wrenching group, volunteers have eaten 143 pizzas. 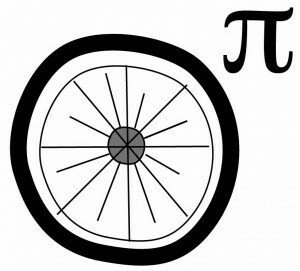 Given that those 143 pizzas were enjoyed during three Friday night wrenching parties each year, how many Holiday Bike Drive bikes have Wheelmen volunteers cleaned and repaired in their 14 years of wrenching for the event? Thank you Karyn, and thank you Portland Wheelmen. We couldn’t do it without you. For information about volunteering to wrench with the Portland Wheelmen for the 2014 Holiday Bike Drive, follow member announcements and sign up early. If you’d like to volunteer during the 2013 Holiday Bike Drive, contact Randi Orth, Community Cycling Center’s Volunteer & Outreach Manager at Randi@CommunityCyclingCenter.org or visit our Holiday Bike Drive volunteer page.